Jacqui Morrison is our guest author today. 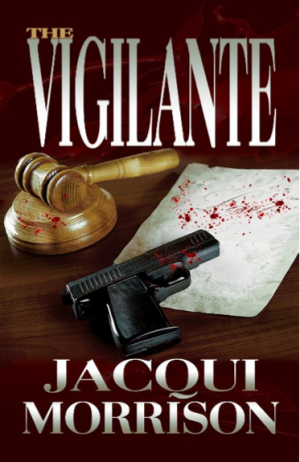 Jacqui has written two suspense thrillers for Lachesis Publishing – Kaitlyn Wolf Crown Attorney and The Vigilante. Her books delve into the gritty underpinnings of society. When did you first realize you wanted to become a writer and why? When my husband and I had our little girl we could only get two TV stations. While on maturity leave I wrote a newspaper column and some fictional short stories. When I read my fictional storySelf-Imposed Isolation out loud people cried. It was then that I knew. Describe your favourite place to write? In the winter my favourite place to write is in a recliner in my bedroom. In the summer, I have a little cabin in our yard named WRITER’S BLOCK. I can hear the birds as I sit in my cabin and write. I have a book on mediation for work and two or three files of projects I’m working on. It’s a real mish-mash. What is your tea/coffee beverage of choice when you’re writing? I took some advice from another writer. He suggested I read books out of my genre. I love mystery and suspense, which are my genre. I choose a non-fiction topic each winter and read everything I can on the subject. The non-fiction helps to inspire my fiction. What is some good advice you can give to an emerging writer? Don’t ever give up. Follow your writing with passion. Hone your craft by attending workshops and meeting other writers. What do you do after you finish a book? Do you celebrate or take a nap? I put the manuscript away for at least three weeks. I’ll work on other pieces and clean my house. If you come by and my house is immaculate then feel free to ask me about the manuscript I just completed. You have written two suspense/thrillers for Lachesis – tell us about both books and what inspired them? I love law and justice – which do not always co-exist. I was inspired to write stories about strong women who had tremendous issues to overcome. You work in the legal/law enforcement world – how has your work influenced your writing? It was the opposite for me. Like my interest in writing, I fell into my career. I saw an advertisement to work at a crisis shelter for women and their children and although I did not have a social work background, I took a risk and applied. In time, I became the court worker for the shelter. I am working on the follow-up to The Vigilante (Murder in the City series). Detective Lynette Wilton and defense lawyer Maxine Swayman will be back in the next book.